1. What investigations should be done in patients presenting with bleeding in the first trimester? 3. How is it managed? Rho(D) immunoglobulin after the D&C.3 For women who do not wish to preserve fertility, and usually those older than age 40 years, hysterectomy may be chosen. Pathological assessment of evacuated gestational tissue is important for confirmation of the diagnosis, for follow-up, and determining prognosis. 4. What are the complications and prognosis? The most serious complication of molar pregnancy is GTN. Patients with beta hCG > 175 000 mIU/mL before D&C are at ultra high risk for GTN with a risk of 85% of developing GTN. Out of 82 women, over half developed GTN with D&C alone; however, none of the women who had hysterectomy alone developed GTN. Other potential complications are hyperthyroidism, ovarian theca lutein cysts, preeclampsia, and cardiopulmonary symptoms.8 With evacuation of the mole, all thyroid abnormalities and preeclampsia resolve and cysts will usually regress in the following months as beta hCG levels drop. Cardiopulmonary symptoms include tachypnea, tachycardia, dyspnea, and chest pain, and may show bilateral pulmonary infiltrates on chest x-ray or rales on auscultation. This usually affects women in the second trimester and tends to disappear within hours of D&C. Benson CB, Genest DR, Bernstein MR, et al. 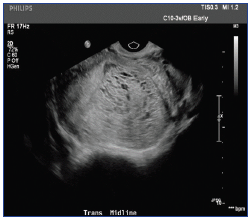 Sonographic appearance of first trimester complete hydatidiform moles. 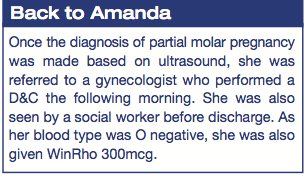 Ultrasound Obstet Gynecol 2000; 16:188. Berkowitz RS, Goldstein DP. Clinical practice. Molar pregnancy. N Engl J Med 2009; 360(16):1639-45. Berkowitz RS, Goldstein DP, DuBeshter B, et al. Management of complete molar pregnancy. J Reprod Med 1987; 32:634. Soper JT, Mutch DG, Schink JC. American College of Obstetricians and Gynecologists (ACOG) Practice Bulletin No. 53. Diagnosis and Treatment of Gestational Trophoblastic Disease. Gynecol Oncol 2004; 93(3):575-85. Soto-Wright V, Bernstein M, Goldstein DP, et al. The changing clinical presentation of complete molar pregnancy. Obstet Gynecol 1995; 86:775.